The feathers on my index- and ring finger are made with brown and grey polish, instead of a combo of black and gray as shown on my middle finger. 1. Start with a white base. I used a grey toned white: My Boyfriend Scales Walls by OPI. 2. With a medium sized striper and black polish draw the first line. If you like this design as an accent nail only, than you could draw the first line higher towards the cuticle. 3. Draw three vertical stripes in different lengths. 4. Use a dotting tool and the green polish to add three different sized dots. I used the same sized dotting tool for all the dots but of course it’s all up to you if you use multiple sized ones 😉 Whatever you feel most comfortable with! 5. Add two yellow dots in between the green ones. 6. Use a blurple polish and gently dot directly in the green and yellow dots. 7. Draw a single stripe to remind you how you’d like the shape of the feather is going to be. 8. Use a medium striper and black polish to swipe small lines. This is much easier when you give the polish a few seconds to dry a bit before you start swiping 😉 Otherwise the lines get to opaque and the feather look will get ruined. 9. Repeat step 8 but use a gray polish instead of the black. 10. Use a dotting tool and orange polish to add three dots in a row. Keep calm, paint on… Have a great weekend! 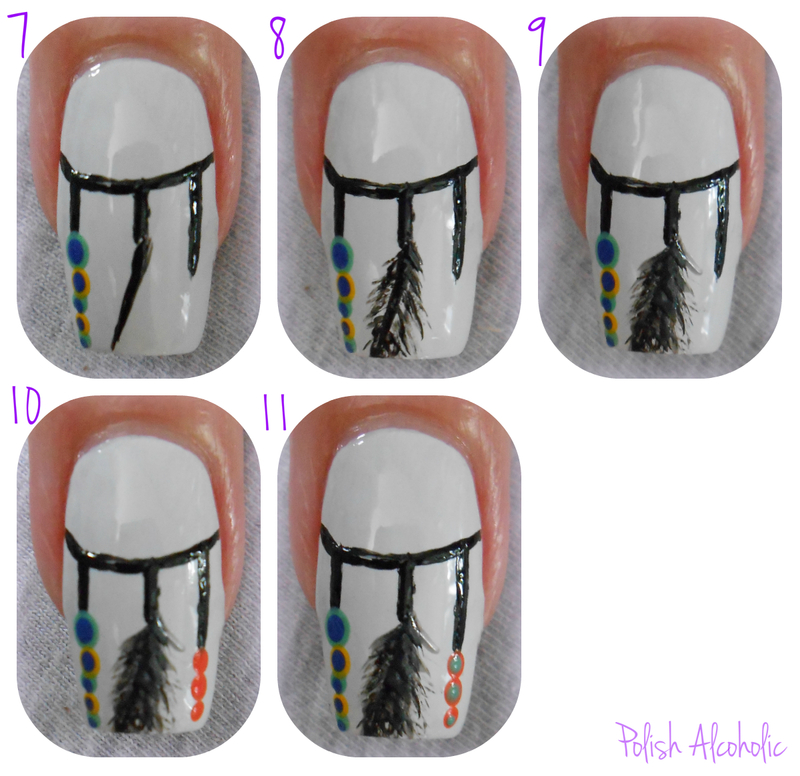 This entry was posted in Nail Art and tagged dreamcatcher, dreamcatcher nails, dromenvanger, dromenvanger nagels, nail art, nailart by Polish Alcoholic. Bookmark the permalink. Oh my! Thanks so much for the shout out! You did an awesome job! Love it! I MUST try this! Loved it since you posted it on insta!!!! These are gorgeous! 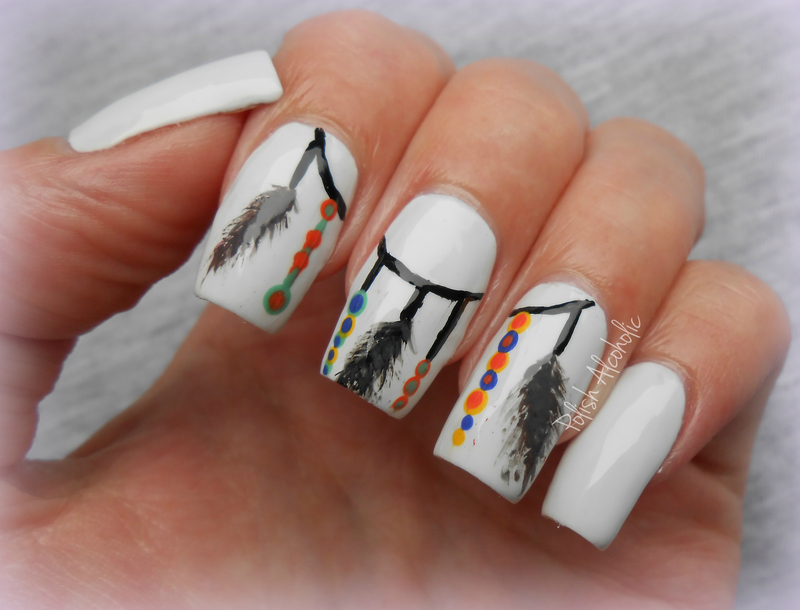 I haven’t gotten to do dream catcher nails yet, but I really want to! Love this! Definitely going to have to remember your feather technique, since those look amazing! You should try it 😀 Thanks! This is so sweet and doesn’t look to hard to re-create 🙂 love it! This mani intrigues me sooo much and is very inspiring! These are AMAZING! I wish I had your talent- I’m going to give this a try, but my nails won’t look as nice as yours! Wicked tutorial, and I especially love this nail art ! I love this- I’m a dreamcatcher fan! The wall over my bed is covered with dreamcatchers! I think I will try this out for the nail art challenge 🙂 Nice tutorial!